Residential garage doors break down all the time. The residents of Juliustown, New Jersey can now have all of their garage door service and repair needs completed by TGS Garages & Doors! 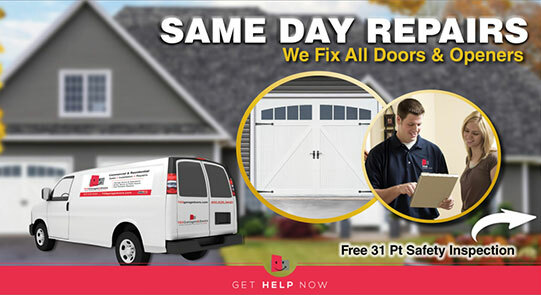 We understand that when you garage door breaks down, it does not choose the most opportune time to do so. We also understand that there is a certain amount of human error that may need to be repaired as well. We offer 24/7 service to the residents of Juliustown to ensure that your home and your possessions are safe and secure! No matter what breaks, we can offer help. Garage door opener repair and garage door spring repair are two of the repairs that we complete the most. When the garage door stops going up or down, or becomes uneven, the torsion spring are probably to blame. After years of use these springs can stretch and/or break. Only a professional garage door repair service should attempt to fix torsion springs! Automatic garage door openers also break down and need professional repair to ensure they get put back into working condition! TGS Garages & Doors also offers full garage door replacements in the unfortunate case of human error! Just give us a call and we can help you pick out the perfect garage door that will fit the overall style of your home and the budget that you have set out. Many people put off regular garage door maintenance services to save money. Unfortunately this can be a bad practice that can lead to big problems later on down the road. As the garage door is the largest and most used door of the home, it will break down if not properly maintained. The professionals at TGS Garages & Doors can come to your home to inspect the working condition of your garage door. If anything needs to be fixed, we can complete it without having to charge your for an additional visit. Ward off a possible garage door disaster by calling the professionals at TGS Garages & Doors for a FREE WRITTEN ESTIMATE at (800) 644-5207!